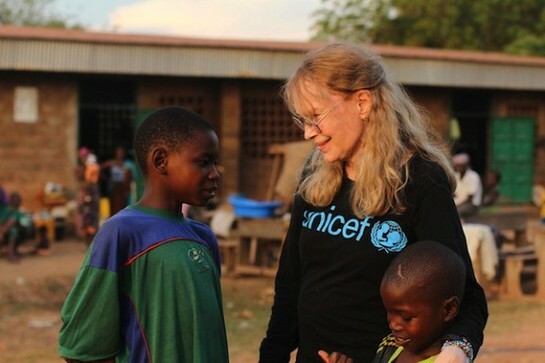 UNICEF Goodwill Ambassador Mia Farrow visited the Central African Republic last month to call attention to children’s needs in that conflict-torn country. Mia Farrow in the Central African Republic. She witnessed “ghost villages” emptied of inhabitants as well as UNICEF’S efforts to help the displaced with shelters, schools and health centers. Video: Mia Farrow in Central African Republic: "The needs here are so great"
“Massive numbers have been displaced. There’s a terrified group of some 35,000 to 40,000 … clustered around a Catholic church. Just living everywhere, in every square inch of that church’s grounds. “If you can imagine 35,000 to 40,000 people and the priest, the monsignor of that parish has said, “If protection doesn’t happen, we will all die.” He didn’t elaborate how; whether everybody would starve to death, whether everybody would eventually be killed."